Competitor Group, Inc. (CGI), operators of the Rock ‘n’ Roll Marathon Series today announced a partnership with Seattle-based Alaska Airlines to become the title sponsor of the Alaska Airlines Rock ‘n’ Roll Seattle Marathon & ½ Marathon, a signature Seafair event. Celebrating eight years as the premier marathon of the Pacific Northwest, the race will welcome more than 15,000 runners to the Emerald City the weekend of June 17-18, 2016 with live bands, cheerleaders and thousands of spectators lining the course. Alaska Airlines has also launched a special portal for runners traveling to races around the world with discounted airfare, special offers and more at alaskaair.com/race. “As Seattle’s largest airline with flights to over 80 cities, Alaska Airlines is proud to partner with the Rock ‘n’ Roll Marathon Series as the title sponsor of our hometown event. This partnership is a natural fit, connecting more racers to the Seattle series as well as aligning with an exciting event that our customers love. Alaska will be partnering with several other Rock ‘n’ Roll races, providing even more race opportunities for our customers. These include San Diego, Las Vegas, Los Angeles, and more,” said Sangita Woerner, Vice President Marketing for Alaska Airlines. The Alaska Airlines Rock ‘n’ Roll Seattle Marathon & 1/2 Marathon kicks off race weekend with a two-day Health & Fitness Expo at CenturyLink Field Event Center on Thursday, June 16 and Friday, June 17. The free expo is open to the public and will feature the latest in running apparel and nutrition products. Live bands and cheerleaders will entertain participants along the scenic course, which starts and finishes downtown at Seattle Center. Both the marathon and half marathon courses offer breathtaking views of the Cascades, Mount Rainier, Downtown Seattle and CenturyLink Field. Upon finishing, participants are invited to relax and celebrate with family and friends at the finish line festival and Toyota Rock ‘n’ Roll Concert Series. 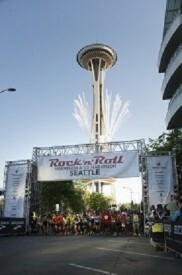 For more information, please visit RunRocknRoll.com/Seattle or follow @RunRocknRoll on Twitter.